A couple of weeks ago an email came in with a track attached of a footwork remix of Omni Trio’s classic Jungle track ‘Renegade Snares’. This was followed this week by a four track EP that took four classics from the Jungle era and flipped them in a footwork style. The only information I was given was a name, Phillip D Kick, and the fact that he was an old jungle fan and wanted the tracks put out as they are, nothing more. 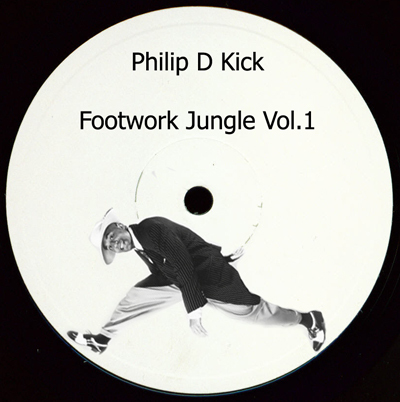 So here you have Footwork Jungle vol.1 featuring Omni Trio, Q Project, Krome + Time and Leviticus all rather amazingly re-imagined in the style of Chicago’s Footwork music. Whether you a fan of the old or the new elements, each of these is a surefire winner. As per the artist’s request we are releasing this as a set via Soundcloud, 100 downloads of each track only. Then they’re gone. Click on the set tracks below to download. Turn up the volume, enjoy. This entry was posted on Tuesday, March 15th, 2011 at 5:50 pm. It is filed under Downloads, News and tagged with Omni Trio, Q Project, Leviticus, Krome & Tyme, Phillip D Kick, footwork jungle. You can follow any responses to this entry through the RSS 2.0 feed.